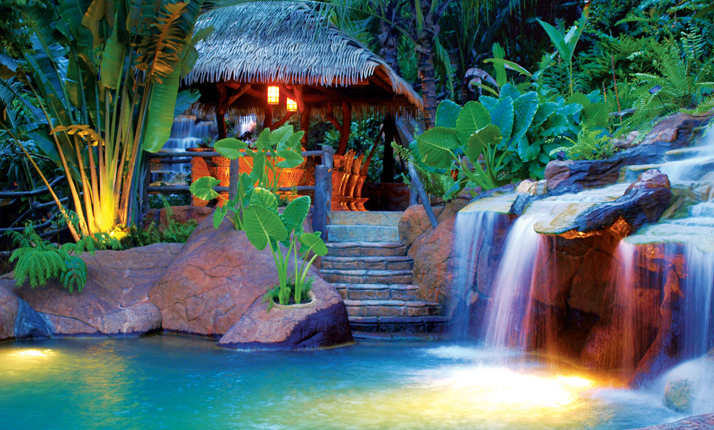 With a spectacular view of the Arenal Volcano, natural hot and cold springs, four unique dining experiences, and an impressive full service Spa, The Springs Resort and Spa at Arenal promises to overwhelm you in every aspect of quality, service and design. The resort perches one thousand feet above the Arenal Valley on a mountain ridge just six kilometers north of the volcano but safely outside the government declared danger zone. 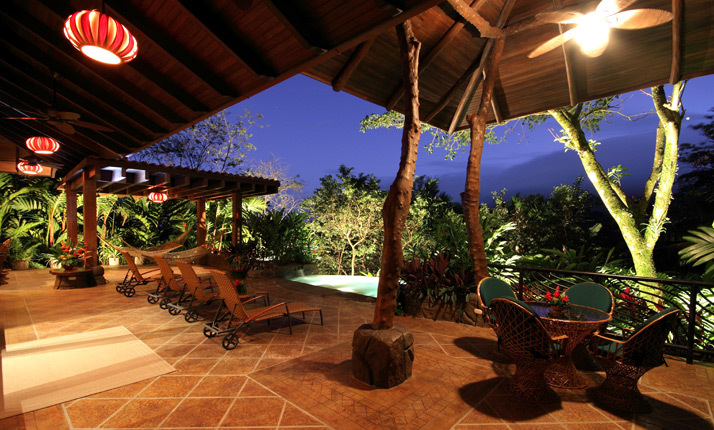 Their higher altitude relative to other hotels in the area allows for not only incomparable views of the volcano, the lush valley, and the surrounding towns that sparkle at night, but also access to the area’s famous prevailing breezes. In fact, the name Arenal is an indigenous word meaning “Window of the Wind”. Each Guest Room and Villa at The Springs Resort and Spa includes a private terrace with balcony and picturesque volcano views, hammocks, rocking chairs, central air conditioning, luxurious marbled bathrooms with Jacuzzi tubs and multiple head showers, satellite television with 37” flat screen TV, surround sound stereo with CD/DVD player and IPOD/MP3/USB connectivity, telephone, wireless Internet access, wet bar, safe, mini-bar refrigerator and coffee maker. The eighteen freeform, landscaped pools provide guests with great views of the volcano and a multitude of options. With temperatures ranging from 76F to 103F and environments that vary from raging waterfalls to tranquil forests, guests can find the perfect pool for their mood the current weather conditions. Tests of the hot mineral springs reveal an ideal natural combination of high bicarbonate and high chlorides with relatively low sulfur content to provide a safe and clean soaking experience. The fourteen thousand square foot full service Spa encompasses one entire level of the reception building and reflects their serious commitment to provide a complete and replenishing mind, body and soul experience. Massages, facials, body wraps, manicures and pedicures are offered in a luxurious and holistic setting administered by trained professionals using the latest technology. Enjoy the finest dining in the incredible restaurant “Las Ventanas” where the only thing better than the view is the food. At night the distant mountains twinkle with the lights of cities thirty miles away. Be sure to dine here at least once during the day and once during the evening to capture the complete experience. 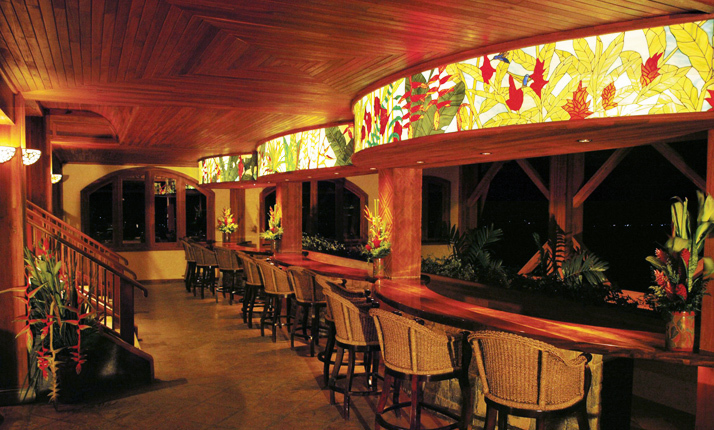 At the Tres Cascadas (Three Waterfalls) their gourmet buffet restaurant would be appropriately described as a “Tasting” experience, where you will sample to your heart’s content a complete salad bar with their signature dressings, hot and cold soups of the day, assorted fresh baked breads, and a selection of hot entrée items of which a few will be specially prepared for you right at the buffet.